At least once a month, I get the same e-mail. It’s an e-mail I like getting because it addresses one of my favorite subjects yet, often, the e-mail sits in my inbox for a few weeks before I can answer it. Then, when I do answer it, I shoot out a scrambled, sputtery response that may or may not be very useful. The question usually goes something like this: “Hey Adam, I’m coming to New York for a few days: where should I eat?” There’s usually something else thrown in—“I’m on a budget,” “I’m a vegetarian,” “I don’t like food that begins with the letter ‘p’”—but, for the most part, it’s the same question. And since that very question sits in my inbox right now from a reader named Angeline I thought I’d answer it here on the blog once and for all; so, without too much fanfare, here it is—The Amateur Gourmet’s Guide to Where To Eat in New York—broken up into various useful categories. Let’s begin with the essential New York bites, the ones no visitor to this city should miss on any account. These are less meal-oriented and more binge-oriented; the intrepid among you might even be able to consume all of them in one day. Please don’t send me your doctor’s bill, if you do. Like the Statue of Liberty, The Chrysler Building and Grand Central Station, the Katz’s Deli pastrami sandwich is New York at its most iconic. Don’t cheat and get waitress service, part of the experience is waiting in the line for a fresser to make your sandwich to order (get it on rye with mustard, of course); they’ll even give you a little nibble while you wait. Make sure to tip $1 in their cup. And of course say “yes” to the pickles. Whether you get it at Murray’s, H&H, Russ & Daughters or Absolute, no visit to New York is complete without a chewy bagel, hot from the oven, schmeared with cream cheese and topped with lox or smoked salmon, raw onion and tomato. Remember my rule: the worse it makes your breath, the better the bagel will be. 278 Bleecker Street (between 6th and 7th Aves. There will be an uproar from the pizza police, but hear me out. Yes Motorino has the plushest crust and DiFara’s is more lovingly assembled, but the pizza at John’s on Bleecker is the New York pizza that New York newbies crave when they touch down at Kennedy airport. It’s cooked in a coal oven, served by the pie only and the waiters are gruff and brusque just like you want them to be. Once you’ve had your John’s you can graduate to the more revered New York pizzas, but this is the essential New York pizza in my book. I’ll confess that I’m not the kind of guy who goes to Chinatown for dumplings on a regular basis, but if I went away from New York for a long time, to a city without good Chinese food, I know that on my return I’d trek over to Chinatown for a massive dumpling binge. 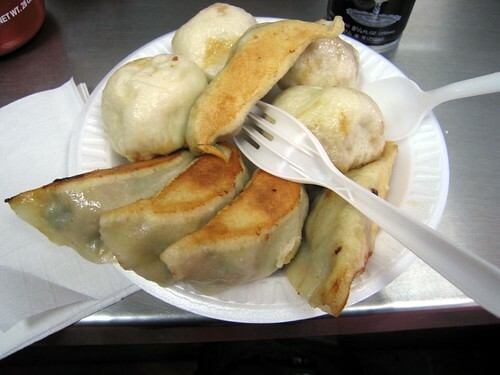 Try “Fried Dumpling” on Allen (just south of Delancey) which is incredibly cheap: five dumplings (pictured above) for $1. 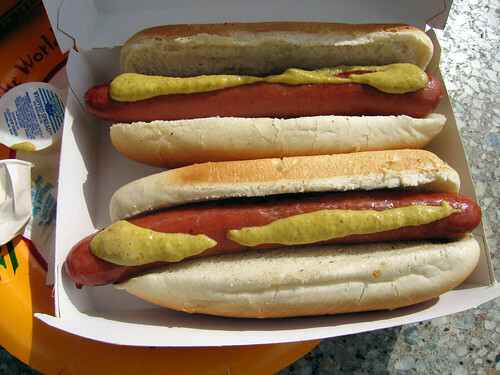 No list of Essential New York bites would be complete without a hot dog, whether the snappy one at Gray’s Papaya (which comes with a drink if you order the Recession Special) or the more difficult-to-get-to one at Nathan’s on Coney Island. And when I say Nathan’s I only mean the one on Coney Island; don’t eat it at the airport, it doesn’t count. 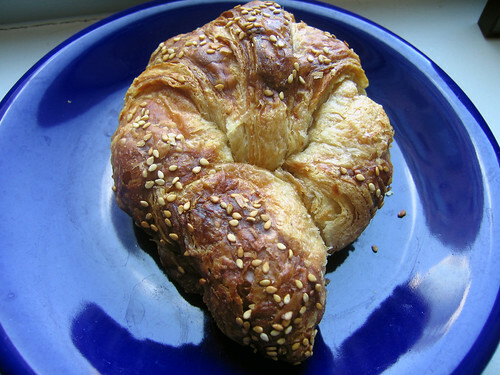 I first heard about the pretzel croissant from my friend David Lebovitz who seeks these out any time he visits from Paris. They’re a strange mix–exactly what the title promises; buttery, chewy, salty, sweet. Fusion baking at its best. 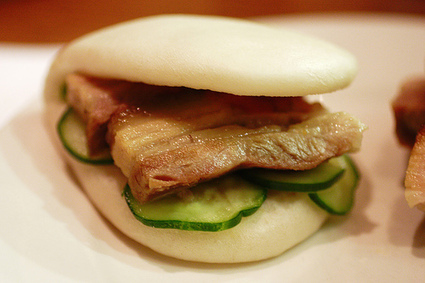 If there were a competition–how much pleasure can you pack into one single bite?–David Chang might easily win with his legendary pork bun. You’ve got the fatty meatiness of pork belly, the sweet kick of the hoison sauce and then the acidic bite of quick-pickled cucumbers. Dress it up with some Sriracha and you’ve got one amazingly pleasurable bite of food. I was recently hanging out with my friend Morgan who works inside the Museum of Natural History. The subject of chocolate chip cookies came up and I said, “Of course you’ve had the chocolate chip cookie at Levain?” His answer–“no, what’s that?–wasn’t just shocking to me, it was devastating. To work that close to one of New York’s greatest cookies and not to eat it? It’s a crime, I say! This cookie is the fattest, butteriest, most intense chocolate chip cookie you will ever have. 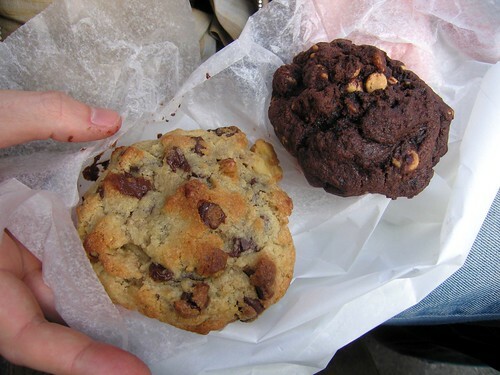 And if you still have room, don’t miss the chocolate chip cookies at City Bakery (already listed for pretzel croissants) and the compost cookies at Momofuku Milk Bar–two other serious cookie contenders. Immediately, when I told Craig about this post, he said: “You’ve got to include The Burger Joint.” The Burger Joint is one of Craig’s and my favorite spots–a secret, hole-in-the-wall burger dive hidden inside a fancy shmancy hotel (Le Parker Meridien). After a Broadway show or a concert at Carnegie Hall (which is right next door) there’s no thrill quite like the thrill of walking into the fancy hotel lobby, turning left at the desk and entering what feels like a small town burger dive. The burgers are pretty great–griddled, thin, topped with onions and mayo and mustard and kechup–but, as far as burgers go, Shake Shack, which has a similar-style burger, takes the cake. 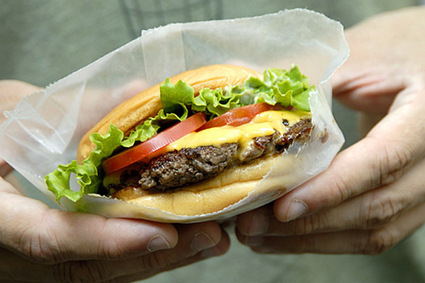 The Shake Shack burger is best eaten when the weather’s nice, when you can sit outside and soak it all in. When it’s cold and nasty, The Burger Joint is the beloved burger back-up. I’ve told you about it before (see here) but this milkshake, no matter how many times you have it, is always a revelation. The sweet caramelized campfire-iness of a toasted marshmallow gets blended into the most sublime milkshake you’re likely to have in this or any other lifetime. And the burgers at Stand are pretty great too. Gazing up at the pictures, so far, you may think I’m trying to kill you. 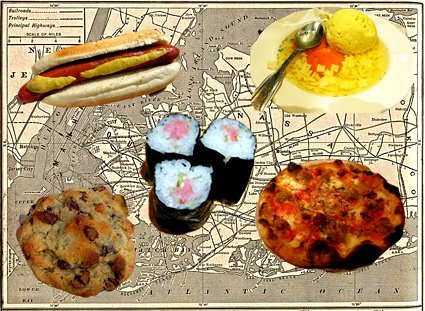 Or that the only food that New York offers is carby, fatty and life-ending by nature. That may be true. But now let’s look to restaurants for something a little more balanced, a little more nuanced, a little more digestible. We’ll start with Five Essential New York Restaurants that I deem essential for various reasons, which I’ll explain below. Note: I’m listing these from the least expensive to the most expensive. Unless you’re coming from China or a city with amazing Chinese food, it’s unlikely you’ve eaten anything like this before. The food to order at Grand Sichuan is, of course, the Sichuan: stay away from your standard Chinese fare (no sesame chicken or beef and broccoli, please.) Instead order the following: pork soup dumplings (make sure to bite a hole and blow first! ), Chong Qing dry and spicy chicken (a plate full of little fiery peppers and chicken bits; not deadly spicy but spicy nonetheless), tea-smoked duck, and–most importantly–the dish you see above: dry sauteed string beans. Also: we prefer the one on St. Marks, but definitely avoid the one on 7th Ave. It’s just no good. 207 2nd Ave., just south of 13th St. If you’re interested in food, food culture and where the food culture is headed, you must pay a visit to David Chang’s Ssäm Bar. Not quite as casual as his Noodle Bar (another valid choice) and not quite as intense as Momofuku Ko (where the food arrives with attitude), Ssäm Bar is always surprising, engaging and exciting. You’ll find everything from the famous pork buns to country ham to fried brussels sprouts to pork shoulder steak to spicy rice cakes. You may get jostled and wait an hour for your table, but once the food arrives you’ll be glad you went. I think the steakhouse is an essential New York institution. Going to one is as much about the food as it is about the environment and the three steakhouses I suggest here (Luger’s, Strip House & Minetta) each offer a steakhouse environment that’s pretty quirky and unique to NYC. 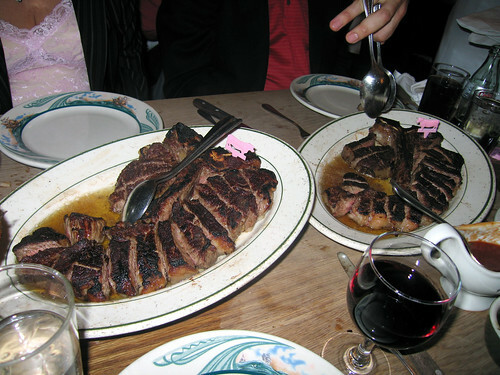 Luger’s, perhaps, is the most famous; you have to go to Brooklyn to get there. There are long communal tables, seasoned waiters, and (not sure if it exists anymore) a strict cash-only policy; Minetta, on the other hand, is in Manhattan and, where Luger is a relic, Minetta is the hotspot du jour. Getting a reservation there is close to impossible, so don’t even think about it! Your best bet is Strip House which Sam Sifton just re-reviewed in The New York Times, elevating it from one to two stars. It’s in an actual former strip house (a bordello, if you will) and the steak, Sam says, is super. If those three don’t work out, there’s always Keens. If I could write a love letter to a restaurant–an actual love letter, on pink paper with perfume and everything–I would write one to Blue Hill Stone Barns (see my post here). I put it on my Essential New York Restaurant List, but it also belongs on my Personal New York Restaurant List and all other lists I plan to write over the course of my lifetime. If, on your trip to New York, you can make it out to Tarrytown to eat at Stone Barns, you will have an experience to rival the best restaurant experiences of your life. The vegetables you’ll eat will have been dug that morning, the turkey you’ll eat will have died just hours before. This is locavore dining at its most pure and, also, its most delicious. If you can’t make it to Tarrytown (it’s a short ride from Grand Central Station) the Blue Hill in Manhattan is equally enjoyable if not quite as beautiful. It’s where President Obama and Michelle ate on their date night last year! If you’ve got the dough, this is where you go. 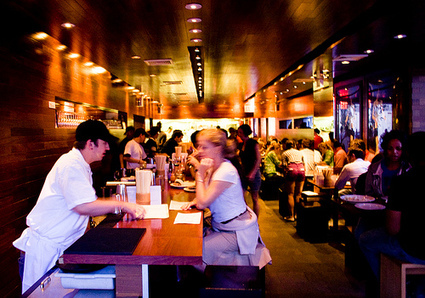 No restaurant in New York transports you, caters to you quite like Jean-Georges. 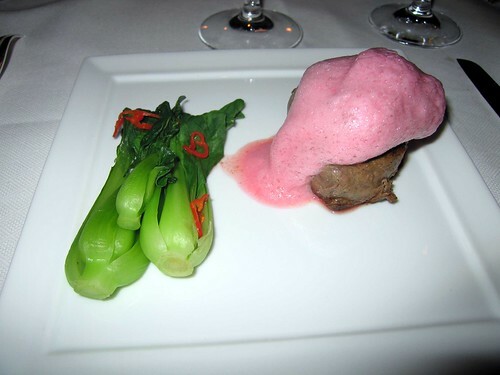 The entire experience is indulgent, from the way you’re treated to the food that they serve; you sink into your chair and the wonders never cease (like that beef with rhubarb foam you see above). It’s expensive, no doubt, but you get big bang for your buck and it’s the kind of formal four-star experience that every food lover should experience at some point in their lives. If you’re a fish lover, Le Bernardin is an equally valid option, but Jean-Georges is slightly more New Yorky. It’s been months since we moved away from Brooklyn, and I can sum up everything I miss the most in one word: Franny’s. Our old apartment was steps away from this remarkable restaurant, a place known for its pizza but equally notable for its freshly sourced ingredients, its lovely salads and house-made cocktails, and incredibly satisfying desserts (don’t miss their toasted almond gelato, it’s otherwordly.) 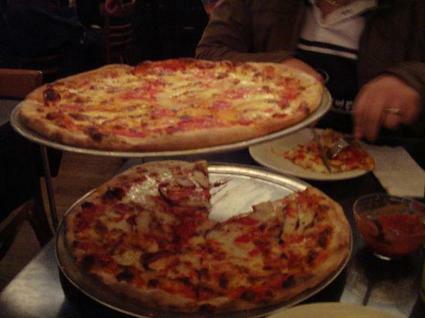 And the pizza, of course, is among New York’s best (if not my personal favorite); get the one with the clams or the one with the anchovies. If you see Maggie Gyllenhall while you’re eating, tell her I’m sorry I fled the ‘hood. 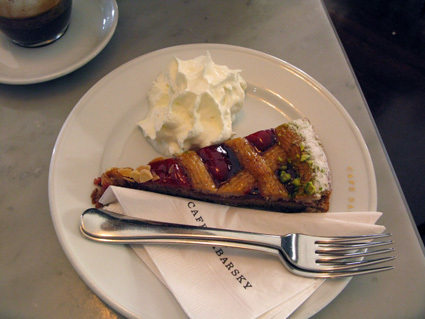 I waxed lyrical about Cafe Sabarsky just a few weeks ago (see here) and I can’t even claim to have eaten much of the food there beyond the pastries and the coffee, but it’s among my favorite places to eat in New York. It’s a room with incredible history, incredible character and wonderful Austrian desserts and coffee. After a visit to the Met or the Guggenheim, get thee to Sabarsky, sit down and soak it all in. You’ll fall in love, just like I did. What’s left for me to say about Prune? I’ve sung its praises many times on here before–like here and here and here and here–and, after all those times, I never get tired of Gabrielle Hamilton’s food. It’s the perfect balance of home-cooked comfort and fancy restaurant fare. 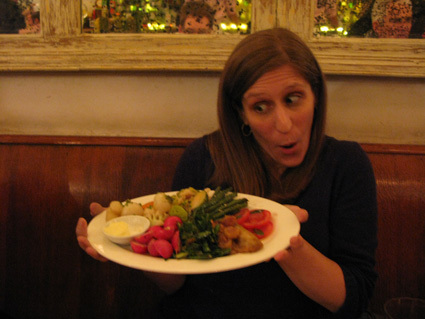 Don’t miss the monkfish liver (it sounds weird, but get it), the whole roasted fish or–for vegetarians–the vegetable plate, which my vegetarian friend Lisa models above. In fact, the vegetarian plate at Prune is a great thing for vegetarian travelers to know about. It’s perhaps the most decadent plate of vegetarian food in the city. Babbo was the first fancy restaurant I’d ever been to without my parents. I remember, after watching Mario Batali’s show on the Food Network for years, making a mental note and saying to myself, “One day I’ll go to New York and eat at Babbo.” And I did. And I loved it. 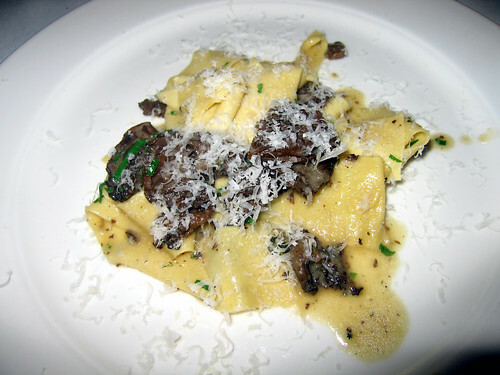 I loved it because Babbo values flavor above all else–the food is robust and rustic and explosively delicious. It’s one of the great New York restaurants and, after visiting again a few months ago, I can report it’s still firing on all cylinders. It’s difficult to get a reservation, so plan ahead. And any leftovers you leave with (unlikely) please give to me. And thus we conclude my massive list of where to eat in New York. Of course, I may have missed a few places (I feel bad not including The Gramercy Tavern, which certainly deserves a place on the list) but no list like this is ever perfect. Lists like this are constantly evolving, constantly changing. For the moment, however, this is where I stand on the subject and I hope you find it useful! Now the next time someone e-mails me for New York eating advice, I have a link to send them. In fact, I’m going to send Angeline this link right now! She’ll probably be sitting next to me at Pearl Oyster Bar in just a few weeks time.